How does an artist begin to paint? How does a sculptor produce an image of such high quality in what is generally regarded as his first work? 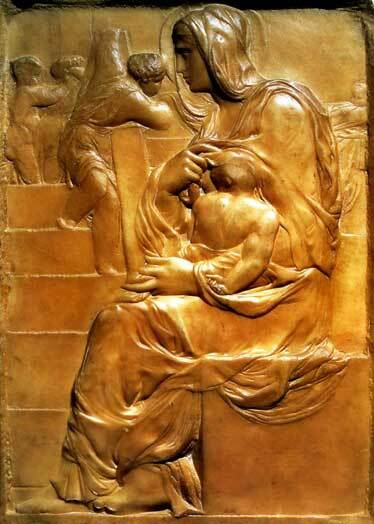 We know that Michelangelo had lived for some time with a stonecutter and his wife during his childhood. Perhaps his introduction into working with blocks of stone was far more intensive than we first imagined. Most artists have early work that can be used to chart the later development of their style. But The Madonna of the Stairs seems at first glance to be a fully mature piece of sculpture, the carving of the drapes half covering the infants head is indeed wonderfully executed. Perhaps Michelangelo did produce some inferior earlier work that has not survived or that he himself destroyed, whatever the reality may be, this stone masterpiece remains as a wonderfully realised, emotionally charged, piece of sculpture. The Madonna of the Stairs 1491/92. Some historians say that this is too sophisticated to be one of Michelangelo's early sculptures but look at the carving of the figure on the left. The arms and legs are not so well defined, the pose is unsure and disproportionate. 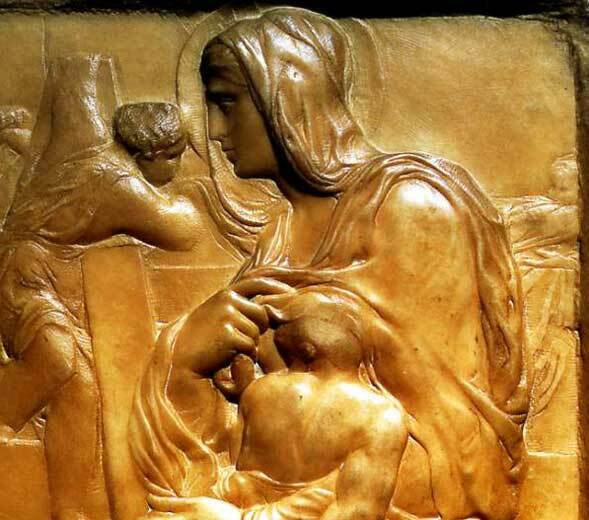 In contrast, the infant, cradled in the arms of the Madonna, displays the heavy muscular form that we associate with Michelangelo's later works.